This book is a collection of fascinating true stories of a doctor’s struggle against the terrifying and invisible world of infectious diseases. I can remember at the age of about ten dipping into my grandmother’s medical books, recoiling in horror at the pictures but fascinated by their message. The real awfulfulness of all things medical hit me hard and I thought I only had hours to live because I must have at least three infectious diseases and the possibility of a host of others. I know now my reaction wasn’t unusual and my morbid fascination with all things gory was something my friends shared. 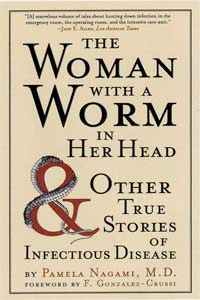 Reading The Woman with a Worm in her Head reminded me of that first encounter with medicalspeak and graphic, dispassionate descriptions of conditions. Dr Pamela Nagami writes of the many patients she has helped through conditions involving bacteria, viruses, parasites and opportunistic microbes. For instance when Danielle Jordan ate a salad, she had no idea she’d become a ‘host’ to an organism that six years later would grow into a worm that would burrow into her brain. An ordinary insect bite on Allan Roth’s foot led to ‘flesh eating strep’. He shed his skin like a snake and had to have a large area of dead tissue removed from his abdomen and upper thigh. We assume most infectious diseases can be treated and those that can’t be are somehow far removed from daily life, but think again. Do you know what ‘souvenirs’ you’re bringing back from your exotic holiday? Killer organisms are also on our doorstep. Written from a practical viewpoint with a wry humour interwoven, Dr Roth’s book is compulsive reading and a reminder of how important it is to pay attention to cleanliness even in our super hygienic Western world. That is not to say we should be scrubbing ourselves and food preparation surfaces fanatically, but simply to be aware and remember the consequences of slackness. Washing hands after visiting the loo is so important as is our responsibility to remind our children and husbands (especially!). A doctor speaking on my radio show about hygiene was emphatic about the importance of washing thumbs. With air travel now taken by a vastly increased number of people, all over the world, basic hygiene could be the definitive feature of survival. So, what ‘souvenirs’ might you be bringing back from your exotic holiday?